These miniature hearts are guaranteed to get a smile from any boy or girl. The smiles, grins, and eyes on each sticker face vary just a bitlike the boys and girls youll share them with. Six vibrant colors make them great for attendance charts and reward stickers. Just over ½" x ½" each. Six sheets, 36 stickers per sheet; 216 stickers per package. 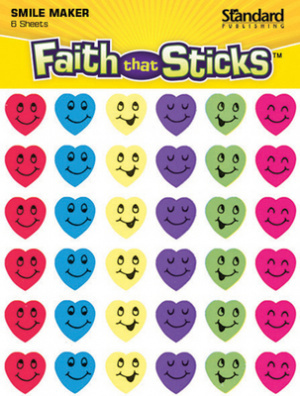 Happy Heart Miniature Stickers by Faith That Sticks was published by Tyndale House in December 2013 and is our 4959th best seller. The ISBN for Happy Heart Miniature Stickers is 9781414393223. Be the first to review Happy Heart Miniature Stickers! Got a question? No problem! Just click here to ask us about Happy Heart Miniature Stickers.